﻿ Remarketing 101: How to Bring Visitors Back to Your Site » Red Mango Marketing! Have you ever seen an ad on social media for a product you were thinking about buying, but didn’t at the last second? Well, as weird as it may seem that ads, targeted just for you, are following you as you surf the internet, the truth is, it’s not really all that weird. This is a marketing strategy businesses of all types are using to convince people to convert into customers. Today we’re going to look at what exactly remarketing is, how it works, and how you might use it in your overall marketing plan to increase sales. Remarketing, also known as retargeting, is a marketing strategy that involves serving banner ads to your target audience. These banner ads are designed to be seen by your target audience after they have visited your company’s website. For example, you might visit a running shoe website because you’re thinking about signing up for a 5K. Then, as you continue to browse the internet, you might see a banner ad for running shoes from the very same company whose website you were just on. Check it out. 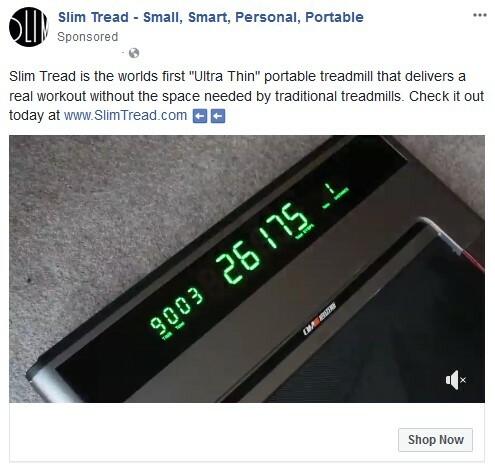 After browsing for running shoes on the internet, and then logging into my personal Facebook account, this advertisement for a treadmill mysteriously appeared. Remarketing only works if you include a special snippet of code on your website enabling it. This way, any time someone visits your website, an anonymous browser cookie will drop, basically marking site visitors as having visited your website. From there, whenever your site visitor clicks on another website (even one totally unrelated to yours), your remarketing ad service provider will know to show your banner ad to them. Why use remarketing banner ads? You might be asking yourself why not just use regular banner ads? Well, regular banner ads target people based on simple things like age, gender, and interests. But that’s about it. General ads based on broad interests display in random places and might never show a product or service that really interests your target audience. But if you use remarketing banner ads after someone has visited your website, you know you’re showing people something that they already showed some interest in. This increases the chances they will click on your ad, return to your website, and actually convert into a customer. Take for instance Loews Hotels, who started using remarketing strategies to drive more traffic to their site and increase bookings. After investing a mere $800 in remarketing tools, Loews Hotels generated a whopping $60,000 in revenue as a result of their remarketing campaign. Not to mention they upped their bookings by 9% and saw a 5% increase in new visitors to their site. As you can see, targeting those that have already shown interest in your company is one of the best ways to remind them that they should come back and make a purchase. Site Remarketing. This is the most simple and popular type of remarketing. Just display an ad to people on other sites after they have visited yours. Search Remarketing. Target people based on their search keywords/phrases. If they use queries that relate to your industry, showing them an ad for your company just makes sense. Social Media Remarketing. This is when you display remarketing ads to people on social media platforms like Facebook after they’ve visited your website. Email Remarketing. Target people with your company’s ads within their email to remind then to come back and finalize a purchase. You can also use the OptinMonster lead generation solution if you want to conduct a more unique form of remarketing called onsite behavioral retargeting. Investing in Facebook and Google ads can be expensive, even if you’re marketing to those that have already shown interest in your business. That’s why you might want to try remarketing tactics on your own website instead. Take for instance Amazon. As you browse products on Amazon, onsite remarketing suggests additional products that may interest you based on your searches. After searching for a professional grade hair dryer, Amazon recommended things like hair brushes, hair clips, and styling products near the bottom of the search page. Using OptinMonster, you can avoid showing returning customers information they’ve already seen and instead show them a message that encourages them to continue down the sales funnel and make a purchase. Not sure exactly how to structure your remarketing ads? That’s okay, we have some perfect examples to share with you. When you’re remarketing to people that have already been to your website, but haven’t converted into customers, you need to advertise to them in different ways to convince them to convert.Rather than displaying a generic ad with your business logo, try using copy that addresses the most common pain point of your industry, then show how your product is the solution to that exact problem, all in hopes of getting you to click and convert. The key here is to find out what problems your target audience is facing and why they may be abandoning their shopping carts. From there, structure your ad around that information. ECommerce shops can track what people view in their shops and use that data to display relevant remarketing ads in order to encourage people to come back and finish where they left off. One such company, ShopBop, does exactly this. Once checking out any number of their products, an ad will appear from them showing you those exact same products you already looked at. Called dynamic remarketing, this strategy serves to remind potential customers of what was being viewed, and gives you the perfect chance to offer additional incentives such as free shipping or discounts to entice people back to your online shop. A lot of times people will visit a site with the intention of making a purchase, find out how much it’s really going to cost, and leave without buying anything. To change this, and invite customers back to finish their purchases, you can send out remarketing ads with hefty deals attached to them. 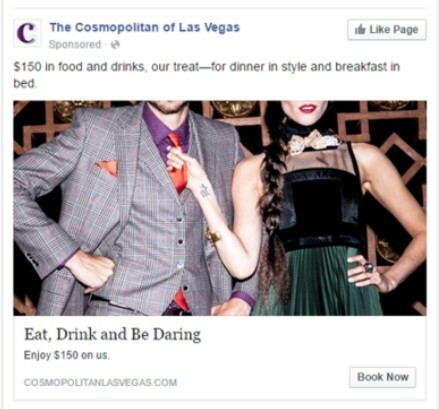 After all, a discounted sale is better than no sale.After checking out the very cool, though extremely pricey Cosmopolitan Hotel and Casino in Las Vegas, one customer immediately noticed a Facebook ad with a $150 voucher on it encouraging them to come back and check Cosmo out. Sometimes all your customers need is a little nudge in the right direction. And, offering a coupon or discount is sometimes all it takes. Cart abandonment is something all online shops deal with. However, if you’re like Best Buy, you can take those seemingly negative instances and make them positive by remarketing to people that added something to their shopping cart and left. 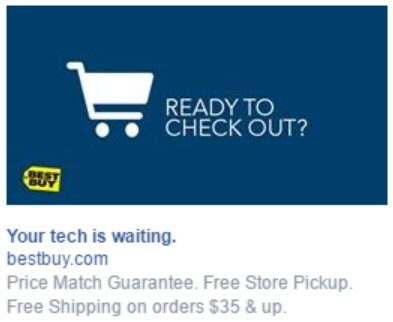 Notice how they ask their potential customer if they’re ready to check out. This reminds the person seeing the ad that they wanted to buy something and may trigger them to return and convert. You never know why people abandon their carts. Maybe they got distracted and simply forgot to finish. Remarketing is a great way to remind them to come back. Use it effectively and it can boost conversions and generate more sales for your business. 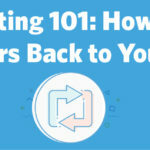 The post Remarketing 101: How to Bring Visitors Back to Your Site appeared first on Constant Contact Blogs. This entry was posted on Monday, May 7th, 2018 at 8:00 am	and is filed under Email Marketing, marketing, News & Updates. You can follow any responses to this entry through the RSS 2.0 feed. Both comments and pings are currently closed.